The new version of the Utah State flag was embraced in February 2011. The Utah state flag features the Utah state seal. The flag of Utah State features the seal of Utah in a golden ring on a navy blue background. It was embraced in February 2011, replacing the previous one that existed since 1913. The Utah state flag features the Utah state seal encircled in gold on a navy blue field. The state seal is a bald eagle perched atop a white shield which depicts a beehive with sego lilies on either side. Above the beehive is written the word "INDUSTRY" while below is written "UTAH" and "1847". Behind the white shield are two spears. 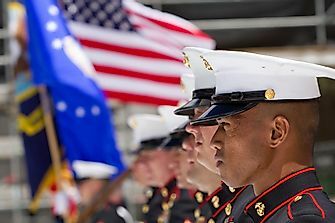 An American Flag hands on either side of the shield. Below the shield is the year "1896". The design of the seal of Utah took place on April 3, 1896, by an artist named Harry Edwards but the first state flag was established around March 1903, and its exhibition was at Louisiana Purchase Exposition. The Daughters of American Revolution later revisited the flag, and the governor marched under it on May 1, 1903. The flag was blue and had hand embroidery of the year 1896 in white that was located at the center of the flag. Sons and Daughters of Utah Pioneers asked for a copy of the newly acquired flag to introduce in a battleship in the year 1912. On its arrival on August 31, 1911, it was discovered that the print had some changes including an extra golden circle on the shield. The flag’s shield was also in full color that was supposed to be white. Instead of redoing it, the state legislature made the law to implement the changes of 1913, which became official. In 2011 during the 59th Utah legislative period, a decision that required flag makers to resolve a mistake in the Utah State flags was made. An error had come up when one maker indicated the year 1847 above 1896 instead of its original location on the shield. The mistake remained uncorrected for about 89 years. 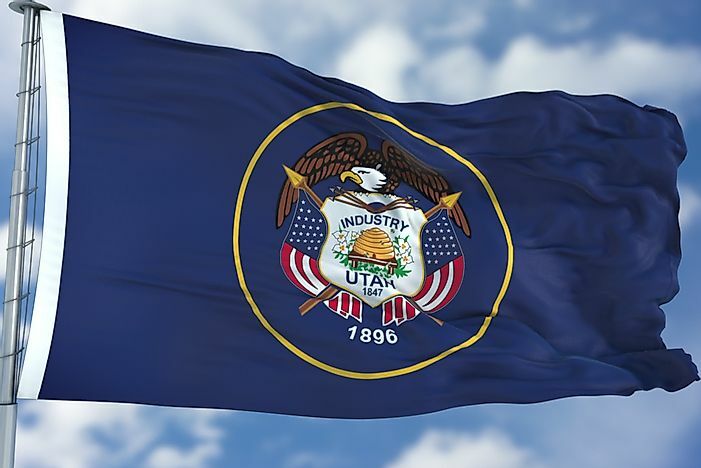 March 9, 2011, was the day that the annual Flag Day in Utah State received approval. The national bird of the United States, which is in the Utah State flag, is a sign of a bald eagle. Notably, it stands for security during war and peace. The year 1847 symbolizes the inhabitance of the Mormon society at Salt Lake Valley while 1896 is the year that Utah achieved its statehood when it was declared the 45th state. The sego lilies on either side of the beehives are also referred to as the flowers of Utah State. They are a sign of peace and a reminder of how early settlers were demanded to eat bulbs of the lily when there was no food. The word "Industry" on the flag stands for achievements and hard work, while the beehive, which is Deseret in Mormon, refers to the territory. Moreover, the US flags in Utah's state flag is a representation of support and dedication to the United States. The sego lily was named the state flower since it grows in dry great basin climate. Sego lily was important that enabled the first settlers to persevere the winters after their arrival in Salt Lake Valley. The bald eagle and the U.S flags were also mandatory as they represented the Mormon's Loyalty to the United States, this was essential because the settlers were considered treacherous towards the US. It even resulted in Utah not gaining statehood until about 40 years after original inhabitance.